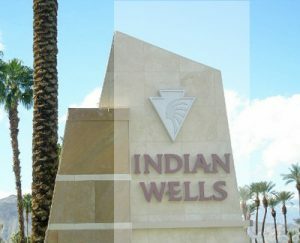 Indian Wells is a city in Riverside County, located between the cities of La Quinta and Palm Desert. Situated in the Coachella Valley, the city encompasses approximately 15 square miles and is currently home to a population of more than 5,000 residents. Indian Wells is known throughout the world for its luxurious and laidback resort environment. Residents enjoy easy access to the city’s incredible amenities, including four world-class resorts, exciting events year-round, a myriad of cultural programs, and exceptional resident benefits. The name “Indian Wells” was documented as early as 1823, appearing in the expedition diaries of Captain Jose Romero, who was tasked to look for a route passing through San Gorgonio Pass to Tucson. Originally a thriving Native American village, the area transitioned into a valuable mining destination after gold on the Colorado River was discovered in the mid-1800s. Indian Wells officially became California’s 400th city on July 14, 1967, just three weeks after 93% of registered voters voted in favor of its incorporation – the highest percentage of voters in the state’s history. Indian Wells features a wide variety of exceptional homes that can offer an unparalleled desert lifestyle for new residents. Buyers will be able to find luxurious condominiums, charming custom homes with first-class features, and extraordinary estates surrounded by breathtaking mountain and desert views. Luxury home buyers searching for their very own paradise in Indian Wells will find many impressive properties boasting a seamless blend of luxury, comfort, and sophistication. Luxury homes for sale in Indian Wells are equipped with a wide range of first-class features, including sprawling open floor plans, high ceilings, gourmet kitchens with top-quality stainless steel appliances, resort-style swimming pools, oversized master bedrooms with panoramic views, and so much more. Indian Wells is home to several world-class country clubs featuring a diverse array of amenities, including championship golf courses, fitness centers, spas, tennis courts, and a variety of social programs. Some of the most prestigious country club communities in the area include Eldorado Country Club, The Reserve, Desert Horizons Country Club, The Vintage Club, Toscana Country Club, and Indian Wells Country Club. Residents of Indian Wells look forward to year-round activities and city-sponsored events, as the city is known to offer one of the finest resident benefit programs in the country. For a full list of resident benefits, visit the city’s official website here. Foodies of all ages can choose from an incredible assortment of culinary choices, as Indian Wells is home to many award-winning restaurants run by some of the best chefs. If you’re looking for some of the top restaurants in the city, be sure to try popular dining destinations such as VUE Grille & Bar, Café Italia, It’s A Deli, and Don Diego’s Restaurant. There’s so much more for you to discover in the charming city of Indian Wells! If you’re ready to begin your search, call us at California Lifestyle Realty at 760.564.1200. You can also send us an email at info(at)califestylerealty(dotted)com.